As a kid growing up I have attended Canada Day celebrations of my hometown of Aurora for years. With the exception of my one year in New York City, this year was the first year I would be celebrating Canada Day elsewhere. Waiting for the show to Start on Parliament Hill. 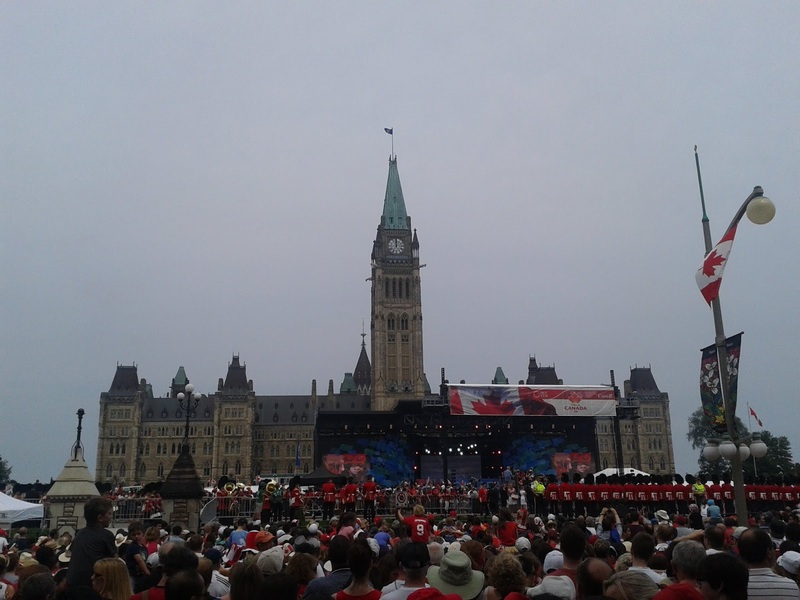 One of the things I've always wanted to do was celebrate a Canada Day in the Nation's Capital, Ottawa. After moving to Ottawa last fall, this year was the year to celebrate the Nation's birthday in style in Ottawa. 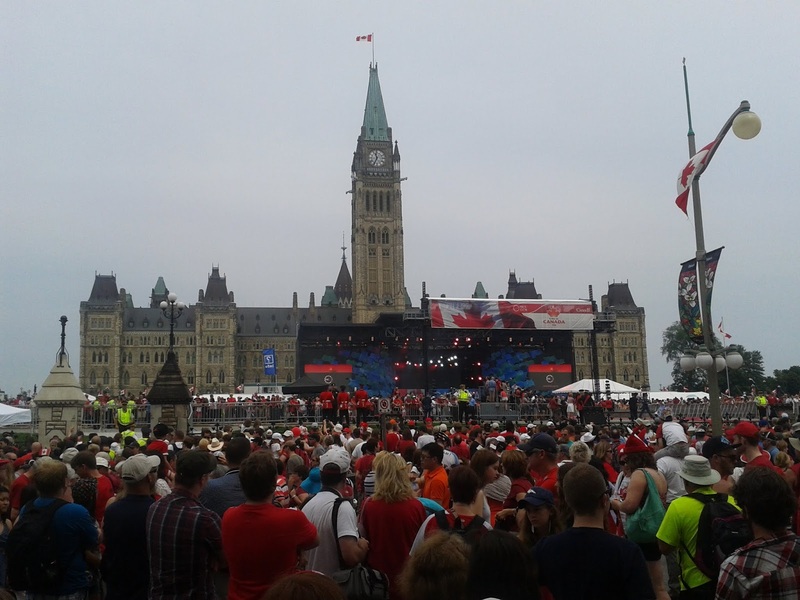 The main show does not start until noon on Parliament Hill. So I spent the morning pretty antsy. First off to the local Tim Hortons for a Canadian breakfast. Of course being a good husband, I left my wife to sleep in a little bit more before leaving. We left at 9:45 A.M. to lucked out by catching one of OC Transpo's newish double decker buses which happened to be running the route 97. We arrived downtown to walk through the Ottawa Jazz Festival's set up at Confederation Park and over to Ottawa City Hall to hear some of the Jazz acts warming up for the day. A short stop at Ottawa City Hall and we were off to Parliament Hill to find some primo standing room for the noon hour show. Travelling up Elgin Street a sea of red and white could be seen. Elgin Street is closed from Laurier Avenue northward towards the War Memorial. Food trucks are present along with various community groups providing entertainment. At Wellington Street we headed westward and settled into the shade provided by the old U.S. Embassy across from Parliament Hill. We waited for 45 minutes for the arrival of the Governor General and his smartly red dressed entourage, the Governor General's Foot Guards. The show started with a fly past by a Royal Canadian Air Force Hercules plane dropping a load of parachutists who either flew the Canadian flag or streamed red mist during their decent. Changing of the Canadian Flag to the Governor General Flag on the Peace Tower. Next came the arrival of the Governor General. Of course, the flag had to be changed on the Peace Tower from the Canadian Flag to Governor General's Flag. With the flag changed, the Governor General arrived and proceeded to inspect the Governor General Foot Guards. As well, the Governor General received the traditional 21 Gun Salute. The sea of humanity on Parliament Hill and Wellington Street was overwhelming. Red and white was seen as far as the eye could see. 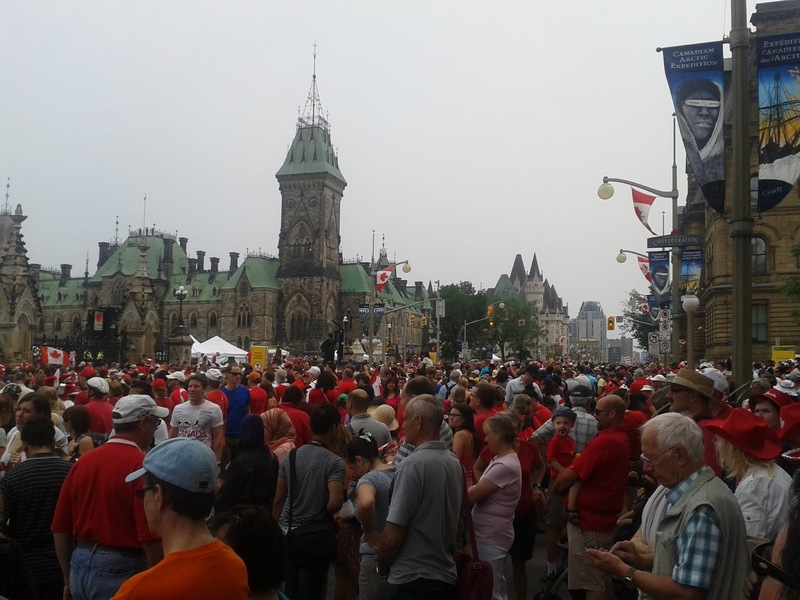 The patriotic crowds on Wellington Street during Canada Day Celebrations. Once the 21 Gun Salute was finished, the Governor General's smartly dressed black busby and red coated Foot Guards marched off the show was ready to begin. The national anthem and God Save the Queen followed by Terri Clark was awesome. Terri Clark sang "Northern Girl" and "Here for a Good Time". The music from there didn't really interest us and the to and fro of the crowds on Wellington Street got bothersome. So my wife and I moved on towards O'Conner and made our way to Sparks Street to look for other options. 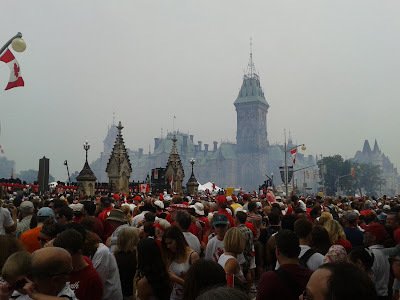 But we had a good time witnessing the start of the festivities for Canada Day.